Well, we struggled to decide on who should get our award this term out of two children - so we chose them both! Grace and Chloe Bayley are sisters who have both impressed us over time with their positive attitude to school life, their caring and friendly personalities and an ever increasing growth in their confidence. 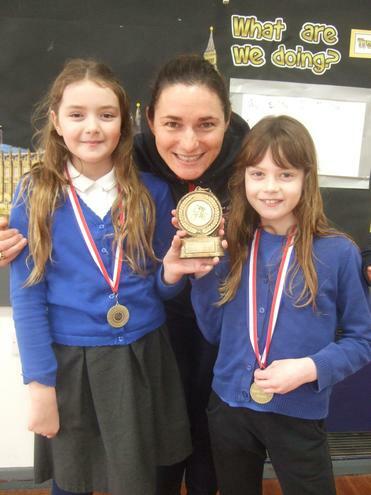 Dame Sarah Storey was in school to present the girls with the trophy, medals and signed photographs. She also brought in her own Gold and Silver medals from her very recent success in the Para-cycling Track World Championships in the Netherlands. Well done Grace and Chloe; we are all very proud of what you've achieved and excited about what you will go on to achieve in the future.